….when satellites show your property from above …you feel thrilled….. 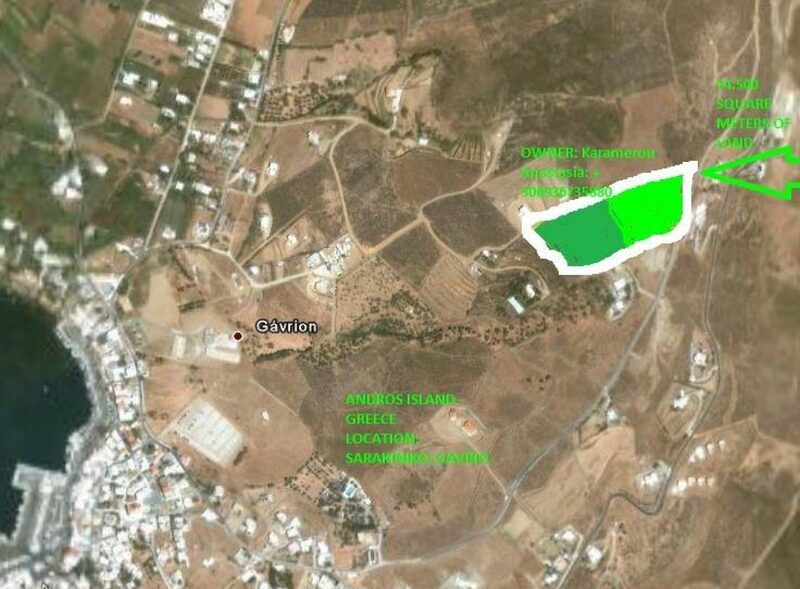 It is a great opportunity to acquire land at one of the most known islands of Cyclades, called Andros. The Greek Golden Visa Programme is growing, and changing to include investments upwards of 400.000€. The Golden Visa Programme was launched in Greece in 2014 and since then has seen rapid growth with International investors embracing the option to invest in Europe. Since then, it has been optimized to include more flexible, inclusive, and friendly terms. In an effort to attract a broader variety and an even larger number of investments, the Greek government is discussing a few upcoming amendments for the Golden Visa Programme. Investors will now be able to apply for a Golden Visa (permanent residence permit) by depositing funds, 400.000€ or more, in a Greek Bank, without the option for withdrawals for several years. They will also be able to invest in an already established Greek company by becoming a shareholder by participating in the capital increase of the company by investing once again 400.000 €. Previously, they were only able to start a their own business rather than invest in an already established one. Moreover, assets like government bonds or listed shares will also be considered an eligible investment, further broadening the options for investors. It is important to note that this is a positive change, increasing the options offered to foreign investors that wish to apply for a permanent residence permit in the Schengen Zone and as far as we know these changes will not affect the existing terms of the Programme. To put this into context, so far one could apply for a Golden Visa either by purchasing any type and any number of real estate in Greece, or setting up a company in Greece, both at a minimum of 250.000€ . These options will continue to exist. The changes stated about are merely add-ons, at a higher minimum amount of investment, for investors who are interested in alternative business endeavors. On many levels, buying real estate in Greece – if you are a foreign national – can be a rather complicated and sometimes confusing process. However, by understanding the process and the various requirements and regulations that apply to foreign nationals seeking to buy real estate in Greece, you can successfully acquire property in Greece. In order to acquire property in Greece there are certain steps that have to be followed through. First of all, the prospective buyer must undertake a search in the land registry and the registry of mortgages in order to ensure that the title of the property is clean, free of any encumbrances (e.g. mortgages, pre-notations of mortgages or any other claims). This research is made by a lawyer or by direct application to the land registry.Then the buyer has to do a formal inquiry with the respective authorities (planning, forest and archaeological authorities) to make sure that there are no permissions against the property and also an inquiry with the tax authorities to make sure that there are no tax liabilities on the property. The most difficult part for a foreign national, if he wants to acquire real estate property in Greece, is the application to the Ministry of National Defence for a waiver of the prohibition stating the purpose for which you plan to use the real estate. The decision-making Committee consists of delegates from the Ministries of National Defence, of Finance, Public Order and Agriculture. Any awarded permission may be repealed by the Minister of Defence. 8) an affidavit with the same content as 7) and, besides this, a declaration, that the purchaser is giving his permission to the Greek authorities to check his personal data. 9) a topographic plan of the real estate asset and the apartment(s) and of the surrounding area (1:5000 or 1:10000). 10) a residence permit or other document, which proves that the purchaser resides legally in Greek territory. In case the purchaser is a legal entity there are further documents required. Each one document must be submitted in the original as well as in 5 officially certified copies, which need translation into the Greek language by a Greek lawyer or by the Ministry of Foreign Affairs. Contracts possibly concluded without the permission shall be treated as null and void. By experience, this process is estimated to last six to twelve months and is free of charge. Contact the Bank of Greece. Greek authorities are very concerned about where a foreign national is obtaining money to purchase real estate in Greece. As a consequence, a foreign national interested in buying property in Greece has to be able to demonstrate where the money is coming from and if he cannot, Greek government authorities will consider any money wired into the country as income and will tax it accordingly. In addition, money to purchase real estate in Greece must come directly from a Greek bank and bank account. Therefore, the prospective buyer will need to open a bank account. Provided that you have proper documentation and provided that you can demonstrate the origin of the money involved, it is not difficult to open a bank account in Greece. AFM: Before anyone – a citizen of Greece, the EU or another foreign national – can purchase real estate in Greece, he must first obtain a VAT identification number, known as AFM in Greece. This number is easy to get and can be obtained at any tax office in the country. Therefore you just need to show your passport and fill in an application. The AFM is then given automatically. However, if you authorize someone else (e.g. a lawyer) to submit the application for you, he will also need a power of attorney. Under Greek law the contract of sale for property can only be executed before a notary public under the obligatory presence of two lawyers (one for each contracting party). If you do not speak Greek, there must be also a translator present, who must also sign the contract. Furthermore the real estate agent or other agents who have been involved in effecting the sale must be present for the signing of the contract. The transfer of property is finalized with the registration of the title in the land registry. Only at that time the ownership of the property is conveyed legally to the buyer. Lawyers and notary public fees in Greece. Greek law provides for a statutory minimum of lawyers fees set at 1 % for a real estate transfer value up to euro 44,020, for a value between euro 44.021 and euro 1.467.000 the fees are 0,5% and for any amount in excess of euro 1.467.0000 the fees are 0,4%. These fees apply to the signing of the contract by the lawyer and do not include the search in the land registry or other acts and applications needed. The notary public (Civil Law Notary) is paid a 3 % fee on the value up to 11.738,67 EUR and 0,5 % on the value above as well as a fee depending on the number of pages of the contract. At last, there is a fee for the registration of the title in the land registry. If you consider raising finance on your existing property to cover the cost of your purchase or secure a mortgage against the property in Greece, there are some other things to consider. For any further information please contact our office or any other lawyer of your choice.